Bridgewater State College has an entire program dedicated to the relief efforts that are taking place in Haiti. For more information, please click the link below. A new organization has come forwarded in town asking voters to vote Yes on Question 1 in the April elections. Please click here to learn more about the group. Click above for a larger image to open. Come see the movie "Haiti: Killing the Dream" followed by a discussion at The Moakley Auditorium on the BSC Campus. The event is this Wednesday evening at 7:00 PM. Drop-in Storytime will be offered at the Bridgewater Public Library on Thursdays at 10:00 AM beginning on February 11 and continuing through March 11. Come join Mrs. Davis for stories, fingerplays and songs centered around a weekly theme. No registration is required for these free programs, which are open to children of all ages. Children must be accompanied by an adult. Each storytime will last approximately 30 minutes. They will be held on the lower level of the library in the Flora T. Little Meeting Room. Parking is available a the rear of the library which is located at 15 South Street. So...your significant other has been wondering what you are doing while you are at The Strength Studio. Here is his chance to see if he can handle the pump! Treat your sweetie to a little Body Pump. Space is limited so you must register by emailing information@thestrengthstudio.com. First Parish Unitarian Universalist Church, 50 School St., Bridgewater, MA will host three Soup Bowl Painting Parties, free and open to the public, as part of their Empty Bowls Project to feed the hungry. The 100 soup bowls will then be sold at an Empty Bowls Soup Dinner Event, to be held in March at the church. All money raised at the dinner will go to the Bridgewater Food Pantry and the church’s MainSpring House Lunch Fund. All ages are invited to attend. No special artistic ability is required. Please call Ellen Bordman, Director of Religious Education, at 508-697-2525 to reserve a spot or for more information. The Wage and Personnel Board oversees working conditions for all of the town's non-union employees. It is a five member appointed board and members are appointed in the following manner: two by the Advisory Board, two by the Selectmen and one by the Town Moderator. The Board's goal is to develop and administer a plan that governs wages paid and certain benefits provided to Town employees that are not employed by contract or pursuant to a collective bargaining agreement. The Board is responsible for providing guidance as to how the plan operates and for the fair and consistent interpretation of the plan. The Wage and Personnel Board typically holds one or two regular monthly meetings. The Board is proactive, meeting with department heads, other boards and Town employees to update job descriptions and discuss questions or concerns regarding the Wage Plan. The Board is required to conduct a public hearing and submit their recommendations regarding any amendments and changes to the plan to Annual Town Meeting. The Wage and Personnel Board currently has three vacancies (one to be appointed by the Moderator and two by the Advisory Board). Human Resources experience would be beneficial. 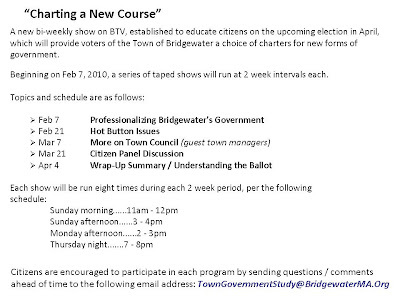 If you are interested in serving Bridgewater in this capacity, please send a letter of interest by January 30th to the Selectmen's Office c/o Lisa Sullivan, 25 South Street, Bridgewater, MA 02324 or via email at lsullivan@bridgewaterma.org. The Annual Town Meeting will be held on Monday, May 3, 2010 at 7:30 P.M.
At the Selectmen’s Meeting on January 5, 2010, the Board voted to set the deadline for submission of Annual Town Meeting Articles. ZONING ARTICLES Must be received in the Office of the Selectmen, Memorial Building, 25 South Street, no later than 12:00 p.m. on Thursday, February 25, 2010. ALL OTHER ARTICLES Must be received in the Office of the Selectmen, Memorial Building, 25 South Street, no later than 12:00 p.m. on Thursday, March 18, 2010. America's Little Angels will be hosting an Open House on Monday, January 11th from 6PM to 7PM. America's Little Angels is now accepting enrollment for January 2010 and September 2010.